Newbery Honor author Kirby Larson brings us the first new Dear America diary in years, taking readers through the attack on Pearl Harbor, the start of World War II, and the Japanese incarceration. With this sweeping tale of life on the World War II homefront, Newbery Honor author Kirby Larson brings her incredible talent to the Dear America series. When Pearl Harbor is attacked, America is finally unable to ignore the wars raging in Europe and Asia any longer. And one girl's entire life is about to change when everything she knows is turned on its head. 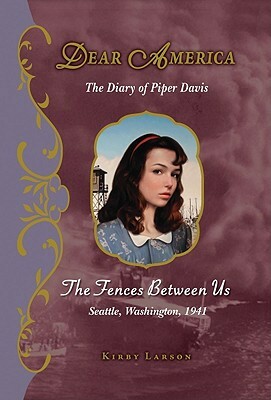 After the devastating attack on Pearl Harbor, where her brother, a navy sailor, is stationed, Piper Davis begins chronicling her compelling journey through one of history's most tragic and unforgettable eras. Kirby Larson is the acclaimed author of the 2007 Newbery Honor book HATTIE BIG SKY as well as DEAR AMERICA: THE FENCES BETWEEN US. She has also written a number of picture books, including the award-winning THE MAGIC KERCHIEF; TWO BOBBIES: A TRUE STORY OF HURRICANE KATRINA, FRIENDSHIP, AND SURVIVAL; and NUBS: THE TRUE STORY OF A MUTT, A MARINE, AND A MIRACLE. She lives in Washington with her husband.